Ocular surface squamous neoplasia (OSSN) represents a rare spectrum of disease ranging from mild dysplasia to carcinoma in situ to invasive squamous cell carcinoma of the ocular surface involving the conjunctiva and cornea, previously known by many names. In a National Institutes of Health Study, the prevalence of OSSN was from 0.03 cases/10,000 population depending on the geographical location. In a study performed in Uganda, the incidence of OSSN was 0.13 cases/1,00,000 persons. OSSN is seen rarely in the Indian population. OSSN is more common in countries that are close to the equator and countries where excessive exposure to sunlight is more common. Risk factors for OSSN include ultraviolet light exposure, fair skin, human papillomavirus (HPV type 16) infection, human immune deficiency virus infection, cigarette smoking, old age, male gender, ocular trauma, ocular surgery, and immunosuppression. OSSN has been reported to masquerade as chronic blepharoconjunctivitis, chronic conjunctivitis, corneal ulcer, pterygium, necrotizing scleritis, and sclerokeratitis., Clinically, diagnosis is suspected by the epithelial changes of ocular surfaces. OSSN has been described clinically as being gelatinous with superficial vessels or papilliform with papillary appearance and leukoplakic with a white keratin plaque covering the lesion. Histopathological examination is essential for the definitive diagnosis and also to differentiate the three lesions in the spectrum of OSSN, i.e., epithelial dysplasia, carcinoma in situ, and invasive squamous cell carcinoma., Recently, immunohistochemically detectable p 53 protein, bcl-2 protein, and MIB-1 are being used as markers of proliferative potency having a possible prognostic value. MIB-1 is a monoclonal antibody that recognizes Ki-67 antigen which is a marker of cell proliferation. bcl-2 is a proto-oncogene which is thought to have a role in oncogenesis by inhibiting programmed cell death and preserving cells from p 53-induced apoptosis. p 53 gene is a common cellular target in human carcinogenesis and is thought to have an important role in cellular proliferation. The interplay between the effects of the mutant p 53, absence of bcl-2 expression, and enhanced expression of MIB-1 is believed to contribute to the progression of OSSN. He complained of brownish discoloration of his left eye (LE) which he had noticed incidentally. A 76-year-old man presented with a history of diminution of vision in the right eye for the past 1 year, which was gradual, painless, and progressive in nature. He had previously undergone LE small incision cataract surgery a year ago, following which his vision had improved and there were no other specific ocular complaints, and he had no significant medical or surgical comorbidities. He complained of a brownish discolouration over his LE. On ocular examination, vision in both eyes was 6/60 National Institute of Public Health. Intraocular pressure in the right eye was 13 mm of Hg and in the LE was 11 mm of Hg. Both the eyes were orthophoric, and extraocular movements were full. Right eye adnexa appeared normal and the lens showed dense nuclear cataract, while the fundus showed a pale disc with generalized attenuation of vessels and grossly tessellated periphery. Examination of the LE revealed normal adnexa and the temporal conjunctiva showed a brownish gelatinous tissue with smooth surface progressing toward the peripheral cornea measuring 7 mm × 4 mm. The adjacent conjunctiva appears injected with prominent feeder vessels [Figure 1]. Lens showed pseudophakia. LE fundus media appear hazy due to synkysis scientilens, disc showed pallor with C:D 0.3:1, well-defined margins, vessels showed generalized attenuation, and periphery was grossly tessellated. Excision and biopsy were performed under local anesthesia. Conjunctival excision with 3 mm margin from the lesion was done along with corneal. Cryo was applied to the margins of the conjunctiva. 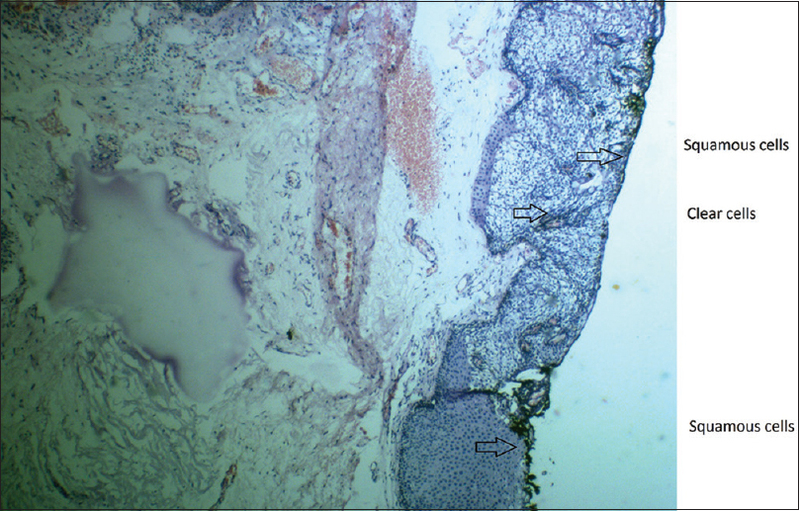 The histopathological report showed normal conjunctival epithelium which was replaced by the dysplastic squamous epithelium with clear cells in some foci, involving the entire thickness of the epithelium, with loss of polarity and severe atypia. 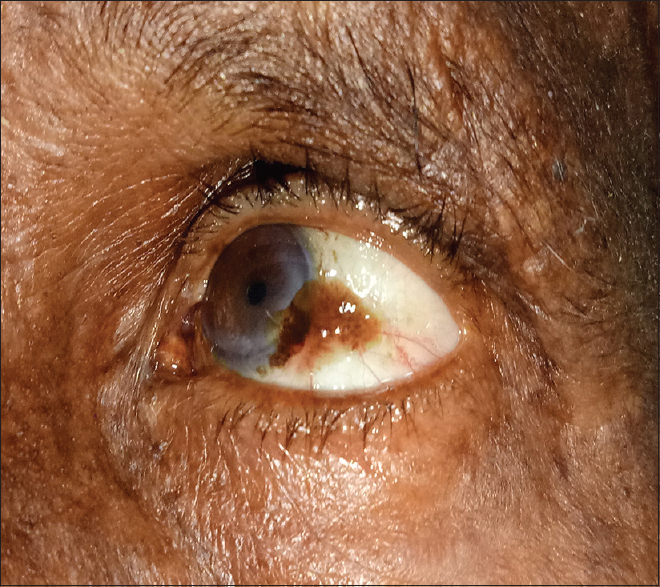 Base membrane was intact with no invasion of the subepithelium which showed edema and vascular congestion, with features suggestive of squamous intraepithelial neoplasia of the conjunctiva [Figure 2]. Lee and Hirst  first proposed the term OSSN to encompass the spectrum of dysplasia, carcinoma in situ, and squamous cell carcinoma of the ocular surface i.e., conjunctiva, limbus, and cornea. The most common clinical presentation of OSSN is an elevated vascularized lesion in the interpalpebral area mostly at the limbus. Symptoms range from none to severe pain and visual loss. Clinically, it is difficult to distinguish between epithelial dysplasia, carcinoma in situ, and invasive squamous cell carcinoma. Definitive diagnosis is made by histopathological examination of the excised biopsy specimen. Although OSSN is considered as a localized, slow-growing lesion with low metastatic potential, intraocular, intraorbital, and distant metastases does occur rarely. OSSN has an intraocular and intraorbital extension rate of 4%, regional and distant metastasis rate of 1.2%, and a mortality rate of 0.8%. Sites of metastasis include the preauricular, submandibular, and cervical lymph nodes, parotid gland, lungs, and bones. Regional lymph node involvement precedes the development of distant metastases. The main cause for metastasis is delayed diagnosis and treatment. Surgical excision with wide margin, nontouch technique is currently the best-established form of treatment. Nevertheless, recurrence of these lesions is common after surgical excision, depending upon the involvement of surgical margins. Pizzarello and Jakobiec reported a 69% recurrence rate when dysplastic tissues was left at the surgical margins; therefore, techniques to ensure clean surgical margins have been applied., Recurrence rates following excision of OSSN alone range from 15% to 52%, with an average of 30%. Recurrence rate is 5% when the surgical margins are free and 53% when the surgical margins are involved. Adjunctive therapy to reduce recurrence includes intraoperative cryotherapy and brachytherapy and postoperative topical chemotherapy using mitomycin C, 5-FU, and interferon alpha-2b. The slow growth of these lesions and the ever-present malignant potential make regular follow-up of these patients for the remainder of their life mandatory. OSSN can present in various ways, and high index of suspicion is needed to pick up these lesions, so proper, adequate, and timely measures can be taken. Sun EC, Fears TR, Goedert JJ. Epidemiology of squamous cell conjunctival cancer. Cancer Epidemiol Biomarkers Prev 1997;6:73-7. Templeton AC. Tumors of the eye and adnexa in Africans of Uganda. Cancer 1967;20:1689-98. McDonnell JM, McDonnell PJ, Mounts P, Wu TC, Green WR. Demonstration of papillomavirus capsid antigen in human conjunctival neoplasia. Arch Ophthalmol 1986;104:1801-5. Pizzarello LD, Jakobiec FA. Bowen's disease of the conjunctiva: A misnomer. In: Jakobiec FA, editor. Ocular and Adnexal Tumors. Birmingham (AL): Aesculapius; 1978. p. 553-71. Spencer WH, editor. Conjunctiva. In: Ophthalmic Pathology – An Atlas and Text Book. 4th ed., Vol. 1. Philadelphia: W.B. Saunders; 1996. p. 106-24. Erie JC, Campbell RJ, Liesegang TJ. Conjunctival and corneal intraepithelial and invasive neoplasia. Ophthalmology 1986;93:176-83. Templeton AC. Tumours of the eye and adnexa in Africans of Uganda. Cancer 1967;20:1689-98. Mohamed A, Chetty R. Human immunodeficiency virus infection, Bcl-2, p53 protein, and Ki-67 analysis in ocular surface squamous neoplasia. Arch Ophthalmol 2002;120:554-8. Mirza E, Gumus K, Evereklioglu C, Arda H, Oner A, Canoz O, et al. Invasive squamous cell carcinoma of conjunctiva first misdiagnosed as pterygium: A clinicopathologic report. Eye contact lens 2008;34:188-90.